Agricultural modeling started in the early twentieth century with the development of regression models exhibiting little attention to causative linkages and mechanistic understanding of the processes involved. This was largely due to limited knowledge concerning soil-plant-atmosphere processes and their response to the complex interactions between various factors in agroecosystems, and also to limited computing technologies available to integrate the processes. 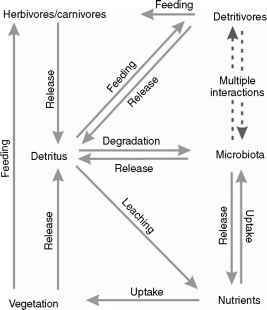 Since the early regression model phase, agricultural process modeling and system integration have undergone many years of development and evolution. Before the 1970s, considerable modeling work was undertaken for individual processes of agroecosystems and a foundation for system simulation was built. For example, in soil water movement, models and theories were developed in the areas of infiltration and water redistribution, soil hydraulic properties, tile drainage, and solute transport. In plant-soil interactions, models and theories were developed for evapotranspiration, photosynthesis, root growth, plant growth, and soil nutrients. In Europe, the development of mechanistic process-oriented models in plant biology began with the pioneering work of de Wit on quantitative relationships in the photosynthetic process, through development of a formula calculating photosynthesis of a closed crop surface. Further research modeling light interception and photosynthesis in plant canopies followed. These results, together with knowledge of the effect of soil moisture on uptake and transpiration rates, permitted a comprehensive approach to the study of the soil-plant-water-atmosphere system and its adequacy for plant growth. Lists of authors on early manuscripts suggest a great deal of interaction between crop simulation groups in Europe and the US. There has been a rich history in the development of agricultural models since that time. The 1980s saw the beginning of the development of whole-system agricultural models. Much of this work began in The Netherlands, at Wageningen. The generic crop model SUCROS for potential production simulation was developed, which formed the basis for recent Wageningen crop models such as WOFOST, MACROS, and ORYZA. For water- and nitrogen-limited production situations, model components were added to SUCROS resulting in models such as ARID CROP, SAHEL, and PAPRAN. Several other important agricultural models developed in the 1980s were CREAMS (soil erosion by water), GOSSYM (cotton crop growth), EPIC (water quality with integrated economics), GLYCIM (soybean crop growth), PRZM (pesticide transport), NTRM (nutrient cycling), and GLEAMS (water quality). System models of even greater mechanistic complexity and level of detail continued to be developed in the 1990s and 2000s including WEPP (soil erosion by water), WEPS (soil erosion by wind), ALMANAC (multispecies crop growth), CropSyst (crop growth), APSIM (agricultural production), OPUS (water quality), SHOOTGRO (wheat growth), DAISY (nutrient cycling), RZWQM (water quality), SWAT (basin-scale water quality), and CSM (crop growth). Some agricultural models have also been linked to a decision support system (DSS) framework - these include GPFARM and DSSAT, which envelopes the CSM (formerly the CERES and CROPGRO model families). Agricultural system research and modeling are now being promoted by several international organizations, such as International Consortium for Agricultural Systems Applications (ICASA) and other professional societies. In summary, agricultural modeling has evolved into detailed dynamic simulations of most physical, chemical, biological, biochemical, and biophysical processes in agroecosystems and their response to climate and crop management inputs. The advent of high-speed computers and other advances in computing technology are partly responsible for this rapid evolution. The enormous time and effort scientists have invested in simulating agroeco-systems are reflected in the seemingly endless number of models cited in literature review articles. Cultivar selection, water and nutrient input optimization, planting date selection, and water quality management are just a few of the areas of agricultural model application in agroecosys-tem management across multiple scales.